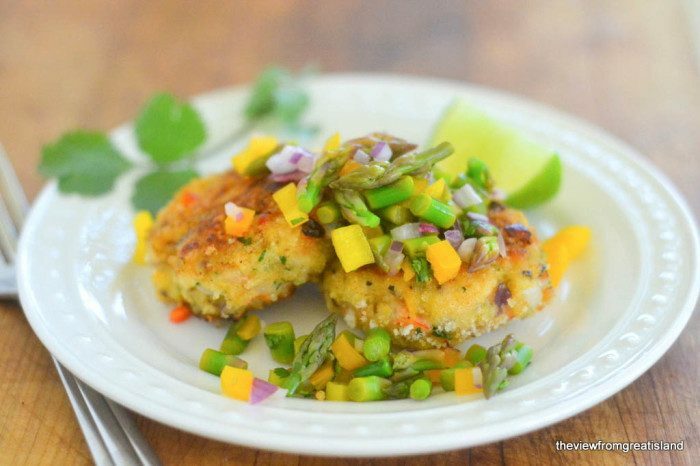 Shrimp Cakes with Asparagus Salsa ~ these crispy tender shrimp cakes with their unique salsa is one of the most luxuriously healthy meals I've ever made! Peel the shrimp and de-vein. Melt the butter in a skillet and saute the shrimp until just turning pink on both sides, but not curling tightly. This should only take two minutes. Put the shrimp and any juices in the bowl of a food processor and pulse the machine 12 times until the shrimp is well chopped, but hasn't turned to paste. You want the mixture to retain some texture. Put the shrimp and all the rest of the ingredients (except the olive oil) into a bowl and mix gently but thoroughly. Using a 1/4 cup measure, form the mix into patties, gently pressing it together as you form them. Coat each patty with more breadcrumbs, just pat them on with your hand if they are very delicate. Set on a plate and cover with plastic wrap and refrigerate for an hour or more to allow the patties to set up a bit. Coat the bottom of a skillet with olive oil and heat on medium high. When the oil is hot, cook the shrimp cakes until they are golden on each side. This should take about 5 minutes per side. To make the salsa, trim the ends off the asparagus and blanch it in boiling water. To do this, bring a pan of water to a boil, drop the asparagus in, and after about 30 seconds, take it out and plunge it into a bowl of ice water. This takes the raw 'edge' off the asparagus and brightens the color. DO NOT leave the asparagus in the boiling water any longer than 30 seconds, and do not wait for the water to come back to a boil or you will get limp asparagus. Pat the asparagus dry and chop it into very small slices. Toss with the minced onion, bell pepper, lime juice, cilantro and salt and mix well. Taste to adjust the seasonings. Refrigerate until needed. Serve the shrimp cakes hot on a bed of lettuce, topped with the salsa.